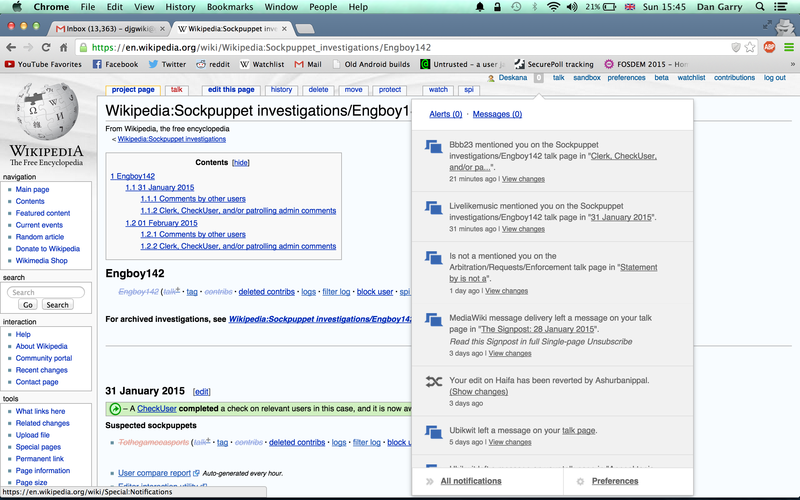 ⚓ T88253 Echo incorrectly calls Sockpuppet Investigations pages "talk pages"
Echo incorrectly calls Sockpuppet Investigations pages "talk pages"
I was pinged on an sockpuppet investigations case and the Echo notification read: "Bbb23 mentioned you on the Sockpuppet investigations/Engboy142 talk page in "Clerk, CheckUser, and/or pa..."." SPI cases aren't talk pages, so my instinct was to go and look at the talk page, but there was nothing there. I scratched my head for a while and then realised it meant the main case page. It probably shouldn't say it's a talk page. Deskana added a project: Notifications. Quiddity set Security to None. Quiddity closed this task as a duplicate of T56433: Notification messages for mentions assume article namespace, do not reflect other namespaces.